Digital rights management (DRM) is a class of copy protection technologies that are used by hardware and software manufacturers, publishers, copyright holders, and individuals with the intent to control the use of digital content and devices after sale; there are, however, many competing definitions. Whhen a program is designed to prevent you from copying or sharing a song, reading an ebook on another device, or playing a single-player game without an Internet connection, you are being restricted by DRM. Apple Inc's digital rights management (DRM) technology is called FairPlay. All the Apple products and devices including iPhone, iPod, iPad, Apple TV, iTunes, iTunes Store and the App Store, and QuickTime use this to limit users. What is better than ever, the purchased individual songs or albums gets no Fairplay DRM any more. But the Apps downloaded from the iTunes Store are DRM locked, and Apple Music subscribed songs as well. Apple Music supports up to 100,000 songs in the music library. When you subscribe the service, you get access to a whole world of music - any of our 30 million songs and all of your songs, and you can play and listen to anyone as you like. Due to Apple music DRM protection, you can't burn any music to a CD, or play them on other audio player or other music streaming service like Spotify, Google Music and so on. That doesn't apply to songs you've synced your Mac. They're either matched to the DRM-free iTunes Store catalog or uploaded as-is. You can then stream and download songs to any of your other devices (up to 10). It supports listening offline, that is to say, you can download songs, albums, or playlists to your device so that you can listen to them when you're not connected to the Internet. If you cancel your Apple Music subscription, those matched or uploaded tracks will disappear from iCloud, but any tracks you've downloaded will remain playable for Apple Music and DRM. Any songs from the subscription catalog, however, will become unplayable. 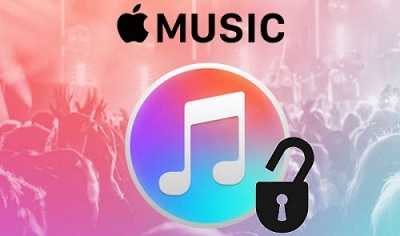 Here we will talk about how to use the third-party DRM removal to unlock your Apple Music offline files. The software you need to get before start. First of all, free download the latest version of Macsome iTunes Converter on your Mac (Windows version ), then install, launch it. 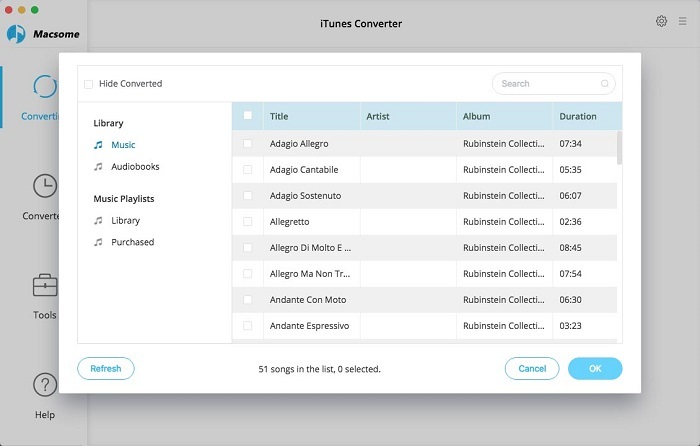 Tips: When you launch the iTunes Converter, it will run the iTunes automatically, if you have launched iTunes before running the Converter, click "Relaunch iTunes" to make the iTunes Converter work successfully. 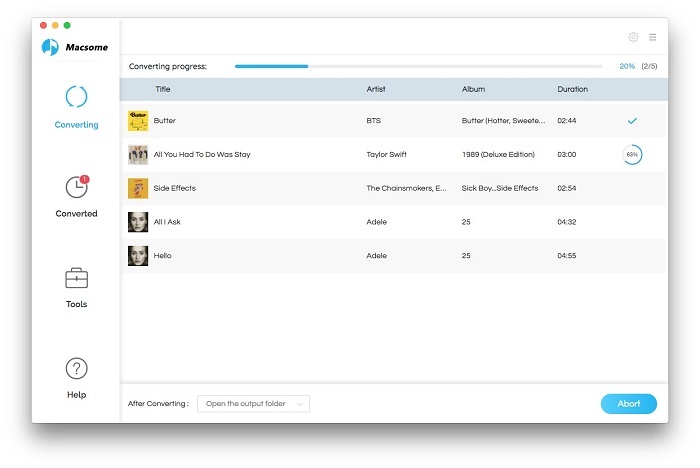 Second, click + button to select the music files from "Music" library. All the music files including Apple Music can be found. Please make sure that all the music files to convert have been downloaded to the Mac. 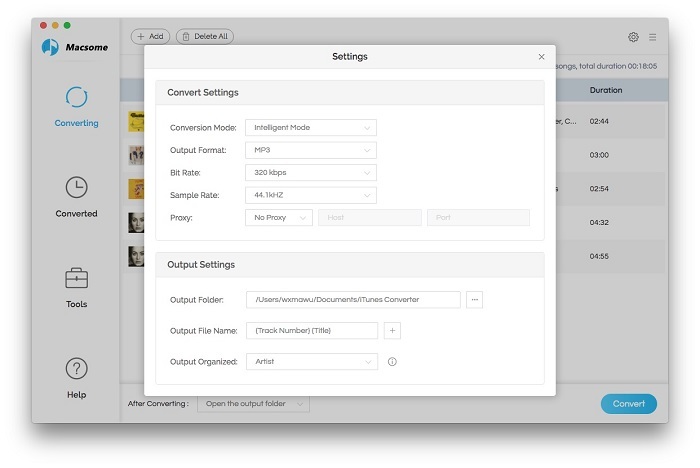 Third, Go to the Menu of iTunes Converter, then click "Preferences..." - "Advanced" to set the output format. Finally, click CONVERT button to start removing FairPlay. When the conversion is completed, the DRM of Apple Music will be removed as well. And you can enjoy the unprotected music files at ease.